How’s this for an introduction? Pizza maven, Tonino “Toto” Morra, has been honored by Gourmet Magazine as “making the best crust in America” — and he’s located right here in the 818. 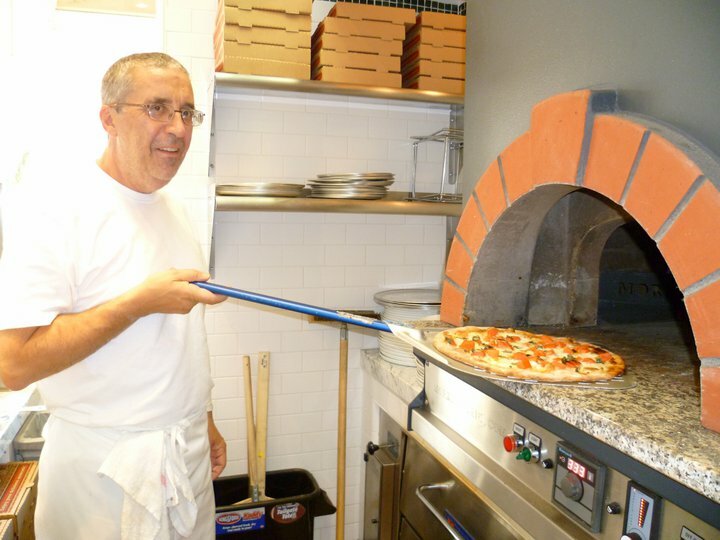 Morra makes his own authentic thin-crust pizza, with homemade dough, hand tossed Napolitana style at Tonino’s Place in Woodland Hills (off of Valley Circle, so closer to Calabasas). The pies are cooked in a wood-burning oven instead of gas or electric so the taste is simpler and the pizza is healthier, even more so because toppings are sprinkled about, not “piled on” and there is no heavy sauce. Tonino is partnered here with another Tonino, Tonino Boniovanni, who adds to the menu his own family’s Roman-style dishes, plus a low-carb section developed by his son, Jonathon Lakatos, a valley-based sports trainer who also sets up nutritional menus for his clients. Pizza fresh out of the wood burning oven. Tonino’s Place is located in a west valley strip mall — a plain wrap, food-driven place with practical prices and generous portions. There’s just enough seating for those who “like to eat it hot.” Boniovanni’s wife, Linda, a firecracker at hospitality, makes the place feel like a major dining establishment from the time you call in on the phone. Also on the menu: a soup of the day, salads, calzones, pastas, entrees, paninis and a kids menu. Traditional pizzas include cheese (18” for $16.95). The gourmet specials list starts with Tonino’s pizza with mozzarella, olive oil, fresh tomato, arugula and shaved parmesan; and the standard bearer, pizza margherita, (each 12” for $14.95). L-R, Tonino and Linda Boniovanni and Tonino (Toto) Morra. Representative of the “Lighter Side” low-carb menu, is a succulent grilled chicken limone ($13.95) with lemon sauce, served with sautéed spinach and arugula salad. Insalata di Pollo ($8.95) is chock full of chicken breast, arugula, celery, carrots, chopped tomato, arrives on a bed of greens with a simple olive oil. A simple balsamic vinegar dressing ties it together. Warning: Even when baked as a loaf, Toto’s textured dough is so crispy and chewy (it has “teeth”) and full of flavor it’s easy to polish off an entire little loaf, especially with the irresistible authentic balsamic reduction dipping sauce ($1.75). Tonino’s Place, El Camino Shopping Center, 23351 Mulholland Drive, Woodland Hills, 91364, 818-591-0600 (take Valley Circle exit). Gerry Furth-Sides is a photojournalist, with a specialty in food and cultural diversity. Her experience ranges from Newsweek editorial and television broadcasting to to west coast radio-TV tours, representing the California food growers, and co-hosting the TV show, “To Your Health,” with Dr. Bradley Frederick. Writing credits include American Institute of Wine and Food Newspaper (AIWF); Frommer Guidebook series, America on Wheels; LA Family Magazine (“Kids in the Kitchen” column).